Okay, this is barely a recipe. It has two ingredients and the most complicated technique required is boiling water. But I have mentioned homemade pectin in several of my posts, because it’s what I use to make jam around here. Previously, however, I neglected to mention how to make pectin at home, which is sort of unfair, right? So, here you go. Bear in mind that fresher, smaller apples and apples such as green apples and crab apples are best for homemade pectin. I used the apples we got from our CSA, which worked fine. Overripe apples have very little pectin in them, as I understand it, so try to use fresh apples. You can also use just the the cores and peels if you want to use the flesh of the apples for baking or apple sauce or apple butter, but use several dozen apple cores and peels if you do so. Furthermore, when you use the pectin to make jam or jelly, it becomes a bit more of a guessing process than using store bought pectin. You’ll need to test your jam a few times to make sure it is set up. It depends entirely on the strength of your pectin, which is determined by the apple type, apple freshness, length of initial boil, length of second boil, and a variety of other factors, I’m sure. The second boil tends to be the most important. I don’t like the pectin super concentrated, because it’s then very, very easy to use too much in your jam and have a jam or jelly that is way, way too stiff. I like to freeze the finished pectin in one or two cup increments, because it makes it easy to fool around with the amount required to get my jam set up the way I want it. The good news is that the process is incredibly easy, incredibly inexpensive, and incredibly hard to screw up. All it requires is boiling. And when it comes time for jam making, it’s very easy to just add more pectin, if it’s not as strong as you initially thought. Add apples to a large stock pot. Cover with just enough water for the apples to float. Bring to a rolling boil over high heat. Reduce heat to maintain a gentle boil. Boil gently, covered, for 2-3 hours or until apples are soft, mushy, and beginning to disintegrate. Line a colander, placed over a medium stock pot, with a fine mesh sieve. Pour the apples through the colander. Cover with a stock pot lid. Let drain several hours, or overnight. Discard the solids. Place the drained pectin over medium heat on the stove and boil until reduced by about half. Let cool. Transfer to 1 cup Tupperware containers and freeze, or can as desired. This blackberry and peach jam was one of the most successful jams I have made to date. The slight tartness of the blackberries is well balanced by the sweetness of the peaches. Because blackberries have a lot of natural pectin, this jam set up even better than my recent blueberry jam. I particularly enjoy the texture from the seeds and partially whole blackberries in this jam, although if you are a big fan of seedless, you will need to run the blackberries through a foodmill prior to using them. The hint of vanilla works really well with the peaches and the blackberries, and adds an interesting, subtle flavor to the jam. Place a metal spoon in a glass of water in the freezer. In a large non-stick sauce pan, add blackberries and peache. Mash them up using a hand masher until mostly smooth, or to desired consistency. Add lemon juice. Turn heat on to medium-high and, continuing to mash, bring to a boil. Slowly whisk in sugar. Let boil for 10-15 minutes. Add pectin, starting with one cup, and let boil hard (so stirring it doesn’t interrupt the boil) for 5-8 minutes. Remove the spoon from the ice water and scoop up some jam. Let sit and cool to room temperature, continuing to boil the jam (reduce heat slightly if it begins to reduce substantially). If the jam sets up to a desired consistency at room temperature, remove from heat and proceed to canning. If it does not set up, add more pectin and boil another 8-10 minutes at a time, continuing to test jam until it sets up to proper consistency. After the first cup, I added about 1/4 cup at a time and ended up using about 2 cups of my homemade pectin. Storage inside of refrigerator for up to one month: Run jar through dishwasher or place in a 200º oven for 10 minutes. Ladle the sauce into the jar and seal shut. Let cool to room temperature and then transfer to refrigerator. Enjoy. Storage outside of refrigerator: Place empty jars on a metal rack or metal collander in a large pot. Fill pot with warm water and bring to a boil. 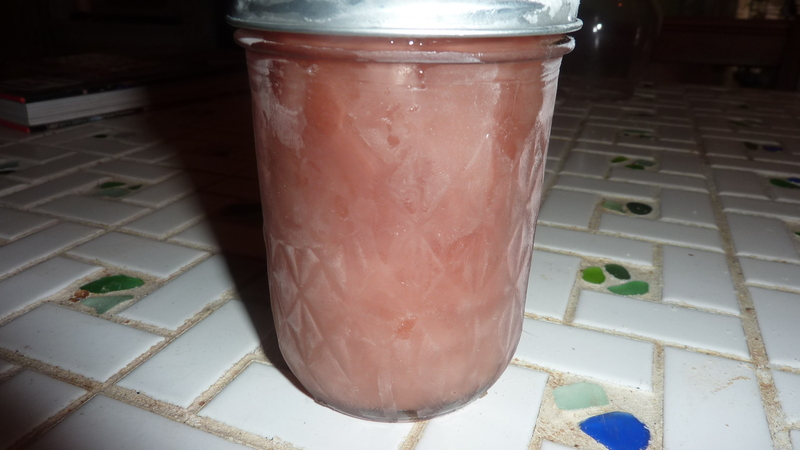 Reduce heat to medium-low in order to keep jars hot and ready for canning. Pour boiling water over both lids and rings. Ladle the sauce into the jar and seal shut. Transfer the jar to the hot water bath. Water must be about an inch over the top of the jar. Raise heat and boil vigorously for 20-25 minutes. Remove from water and let cool. Once opened, lid should make a “pop” noise if it was properly sealed. One of my favorite mid-morning snacks at work is a toasted whole wheat crumpet with something on top – butter, jelly, jam, cream cheese, whatever. 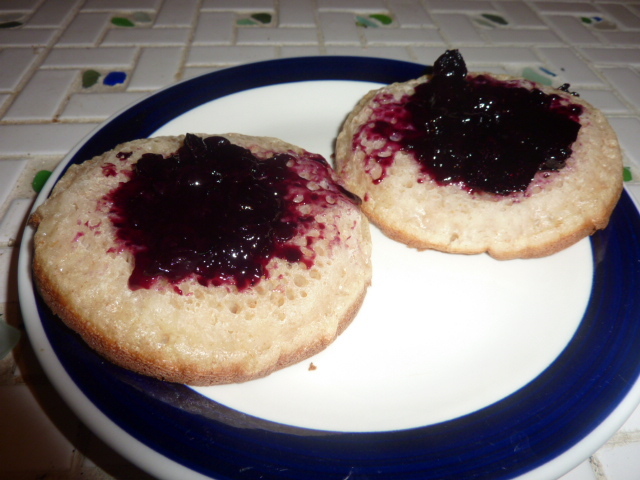 When I saw the blueberries in this week’s CSA share from Geauga Family Farms, I knew some homemade jam would be a really great addition to a crumpet. Plus, I have a good amount of homemade pectin in the freezer (which, not-so-coincidentally, was made using CSA apples last fall). I didn’t post the recipe for homemade pectin when I made it, but in the recipe below I included a link to a website that details the process. It’s very easy – basically, chopping up apples and boiling them, or using apple stems and peels and boiling them. However, because the strength of the pectin is going to vary greatly from batch to batch in homemade pectin, it makes the jam a bit more of a guessing process. I used 1 1/2 cups of frozen pectin, but it may take more or less to make your jam set up. It is certainly more of a trial-and-error process than using store bought pectin and took me a few tests before I got it right. In the end, though, it was well worth it and not very difficult at all. The flavors of this jam are simple and straightforward – fresh, sweet blueberries and politely assertive lemon with just a hint of coriander and cinnamon to every bite. The real star here, of course, is the humble little blueberry. It’s the predominate flavor, kept interesting by the whisper of lemon and spice in the background. 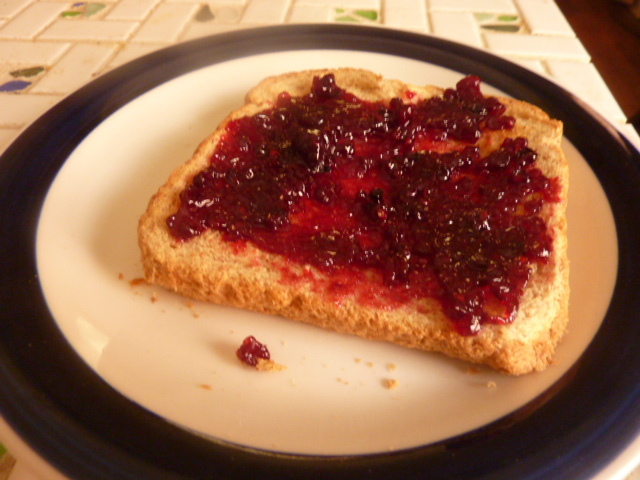 This is the most successful jam that I’ve produced. I was so, so happy with how well it gelled. I now have the utmost faith in my homemade pectin. I can’t wait to get more apples from the CSA so I can make more homemade pectin (and share the process with you all). Because more pectin = more delicious homemade jam. In a large non-stick sauce pan, add blueberries. Mash them up using a hand masher until mostly smooth, or to desired consistency. Add lemon zest and lemon juice. Turn heat on to medium-high and, continuing to mash, bring to a boil. Slowly whisk in sugar. Let boil for 3-5 minutes. Add pectin, starting with one cup, and let boil hard (so stirring it doesn’t interrupt the boil) for 5-8 minutes. Remove the spoon from the ice water and scoop up some jam. Let sit and cool to room temperature, continuing to boil the jam (reduce heat slightly if it begins to reduce substantially). If the jam sets up to a desired consistency at room temperature, remove from heat and proceed to canning. If it does not set up, add more pectin and boil another 4-5 minutes at a time, continuing to test jam until it sets up to proper consistency. After the first cup, I added about 1/4 cup at a time and ended up using about 1 1/2 cups of my homemade pectin.